Republic to restoration cuts across artificial divides between periods and disciplines,often imposed for reasons of convenience rather than reality. Challenging the traditional period divide of 1660, essays in this volume explore continuities with the decades of civil war and the Republic, shedding new light on religious, political and cultural conditions before and after the restoration of church and king. Transdisciplinary in conception, it includes essays on political theory, poetry, pamphlets, drama, opera, art, scientific experiment and the Book of Common Prayer. Essays in the volume variously show how unresolved issues at national and local level, including residual republicanism and religious dissent, were evident in many areas of Restoration life, and were recorded in memoirs, diaries, plays, historical writing, pamphlets and poems. An active promotion of forgetting, and the erasing of memories of the Republic and the reconstruction of the old order did not mend the political, religious and cultural divisions that had opened up during the Civil War. In examining such diverse genres as women's religious and prophetic writings, the publications of the Royal Society, the poetry and prose of Marvell and Milton, plays and opera, court portraiture, contemporary histories of the civil wars, and political cartoons, the volume substantiates its central claim that the Restoration was conditioned by continuity and adaptation of linguistic and artistic discourses. 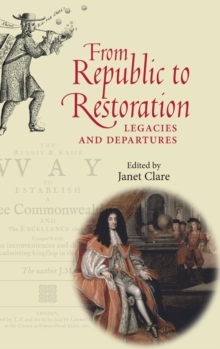 Republic to restoration will be of significant interest to academic researchers in a wide range of related fields, and especially students and scholars of seventeenth-century literature and history. -- .